Widen KY 237 (Gunpowder Road) from KY 536 (Mount Zion Road) to US 42 to improve safety and mobility through central Boone County. Install a multi-use path along the improved roadway. Reconstruction of KY 237 (Gunpowder Road) will eliminate the geometric deficiencies along the roadway and improve safety. Improvements to this portion of KY 237 will complete a series of continuous improvements to the route from KY 536 to Hebron. 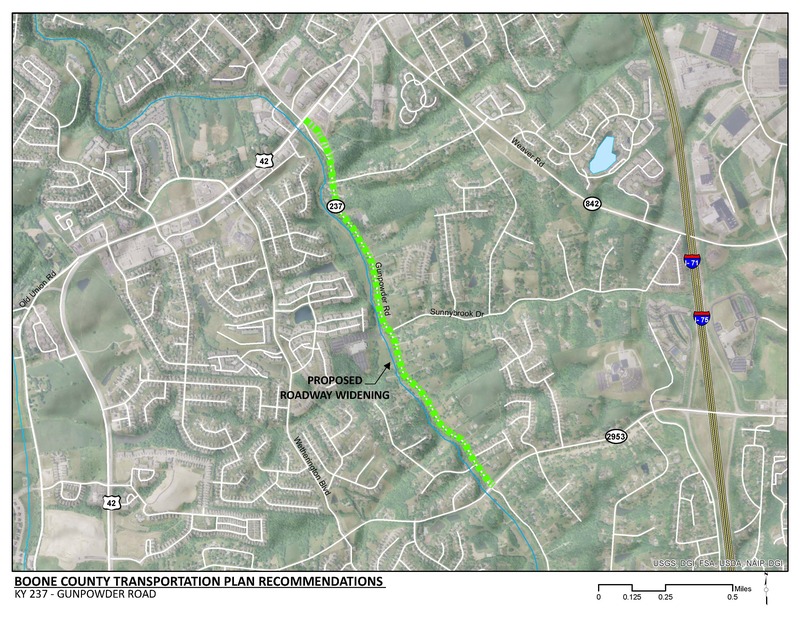 This project will improve mobility by providing a safe and reliable alternative to US 42 and KY 536 (Mount Zion Road). The project will reduce the frequency of flooding along the roadway. A multi-use trail would provide a continuous connection to commercial development, schools and parks with a scenic view of Gunpowder Creek. This project is consistent with Boone County’s overall goal of improved safety and connectivity for bicycles and pedestrians. Click HERE for a map of multi-use paths in Boone County. The project will require additional right of way. The project will need to avoid or mitigate impacts to Gunpowder Creek and potential historic properties. As housing development in the Union area continues to expand, traffic is expected to increase along this roadway. The land use adjacent to KY 237 is primarily rural density housing and churches. The 2040 land use map shows that future suburban density housing is expected in this area. Gunpowder Creek runs along the west side of the roadway. Potential historic sites on the National Register of Historic Properties were identified within the project area. There are existing geometric deficiencies along the route such as sharp curves, narrow lanes, and narrow shoulders. The existing cross section is not consistent with the use of the roadway. Future expansion of suburban density will increase resident demand for dedicated bicycle and pedestrian facilities along the roadway. Both the north and south project limits connect to multi-use paths.